In ABAP programming PERFORM statement is used for calling a subroutine ( Piece of reusable functional code defined with FORM statement ). We can call the subroutine defined in the current executing program or from an external program. A subroutine will be enclosed in a FORM and ENDFORM statements. Values are passing to subroutine by USING & CHANGING additions. 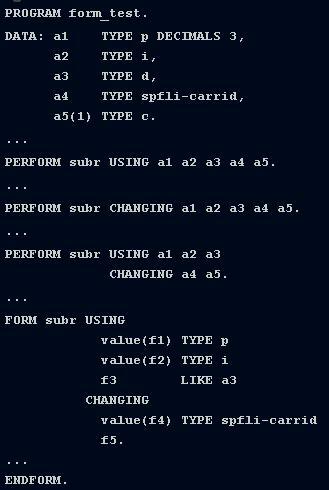 See an Example Program. PERFORM subroutine_name IN PROGRAM external_program_name.